Our return to Locmiquelic and Whileaway went well and we were back on board by 1800 BST having left home 10.5 hours earlier. Our journey involved taxi to Warminster station; trains to Southampton Central and then Southampton Airport; flight to Nantes; bus to SNCF station; train to Lorient; bus to Port de Peche; and ferry to Locmiquelic! We even had nearly 2 hours waiting for our train in Nantes, sitting in 25C in a very attractive park near the railway station as we had a sandwich lunch while waiting for our train. We decided that we should have a relatively short passage the next day especially as that meant returning to the R Belon about 17nm north. We had called in there on our way south in May and enjoyed an excellent Plateau de Fruit de Mer at the renowned Chez Jacky. You cannot have too much of a good thing and we were not disappointed! 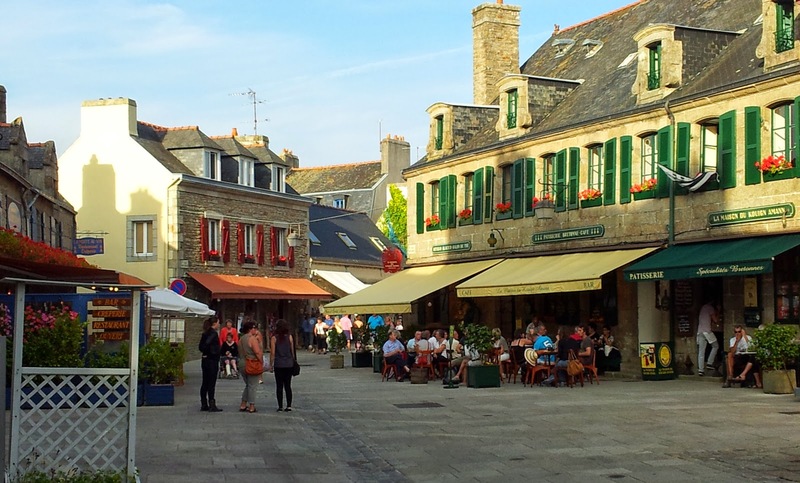 On Friday morning we headed for Concarneau. We left Belon as soon as we had sufficient rise of tide to enable us to cross the bar at the mouth of the river and motored north in a light wind under a sunny sky. We moored in the marina under the ancient city walls and spent the rest of the day doing domestics such as replenishing stores from the supermarket and visiting the launderette! And exchanging notes with fellow sailors! Sadly this is the time of year for making passage home. Our French neighbour on the pontoon was heading for Vannes in the Morbihan Gulf; whereas a Welsh couple in Eos were, like us, heading north, in their case for Chichester as they needed some repairs. On Saturday morning we went to the market hall and purchased some excellent fresh shrimps and merlu (fish) for dinner. We then had an enjoyable very warm afternoon cycling around the old port and then the southern headlands looking at the views and discovering some really tucked away drying river estuaries. Finally we had a leisurely walk around the old city, quieter than in the busy months, but still with quite a few visitors. On Sunday we left early, just after 0700 BST. Our plan was to round the Pointe de Penmarc'h from where we turn NW and to then to moor overnight at Ste Evette, about 10nm S of the Raz de Sein. This would be a passage of about 35nm, perhaps just over 6 hours at our usual cruising speed. But if we could make good time and get to the Raz with the tide still with us we could press on. As it happened we had another warm sunny day, but quite misty and thus regrettably with little wind. This did though give us a flat sea. Apart from enjoying our first sight of dolphins this summer, two pods as we motored towards the Raz, there was little else to seen in hazy visibility. We arrived at the Raz with just under an hour to spare before the tide turned. Success! 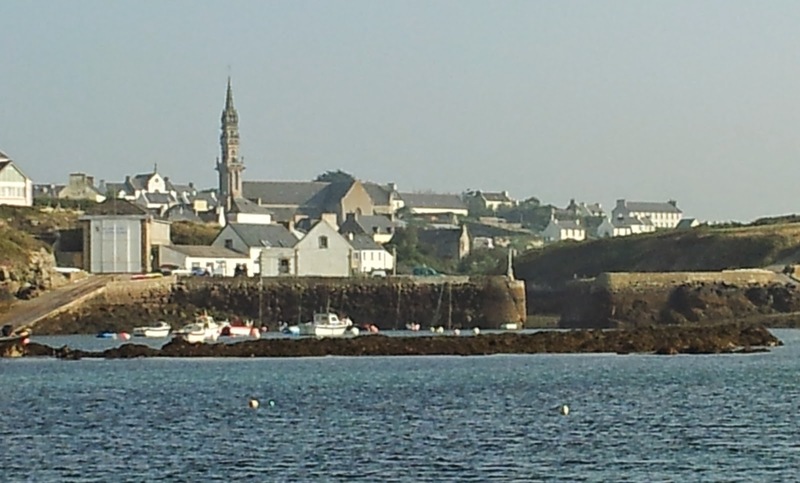 Of course after the Raz we had to begin to fight a little tide but we arrived in Camaret just SW of Brest and after 63nm at 2000 local time and picked up a mooring for the night. On Monday morning we moved into the harbour to discover, sadly, that the Harbour Master was away for two days (exceptionalle!). What a shame; free mooring! On another sunny afternoon we again cycled this time along the peninsular to the east. Many old and current military fortifications here as this peninsular guards on one side the entrance to the Rade de Brest. For some time I have been intrigued by the Ile d'Ouessant, that windswept land on the NW coast of France looking out to America and which has many shipwrecks around it. There are two possible mooring and landing points, one exposed to the SW (and winds from S to NW) and one to the NE (and winds from NW to SE). Unusually we had a forecast of NE or E moderate winds enabling us to visit the main settlement of Lampaul in the SW part of the island. It was a tricky passage some 30 nm WNW of Camaret out into the Atlantic. Another warm but hazy day so plenty of time trying to discipher shapes in the mist before we clearly made out La Jument the lighthouse on the SE tip which guards many rocks. We then had to cope with a rip current and swirling waters that rush us past the entrance to a deep and wide inlet. Once we had the sails down and regained control we started to motor the 2nm up this wide bay at the jead of which are visitors mooring bouys. We then took our dinghy ashore to discover an island that is certainly different. The houses seem to crouch into the landscape as if hiding from the wind and adverse weather. The landscape is mainly scrub with only about a third cultivated. There are some shops and restaurants and a few tourists clearly help to sustain the economy. The island is probably cut off for days at a time by adverse winter weather so you have to be happy to live here. That evening the Mist comes down and Iit felt like a remote part of Cornwall (if there is such a place any more!). Next day it is sunny and we see a unique island in a good light!